A contemporary of the Nouvelle Vague directors but never really one of them, Claude Lelouch continues to plug away at the age of 80, releasing a film annually to the indifference of French critics. In the States, his legacy will likely be the derisive laughter of high school French classes forced to sit through A Man and a Woman, but there are some genuinely interesting titles in his filmography. 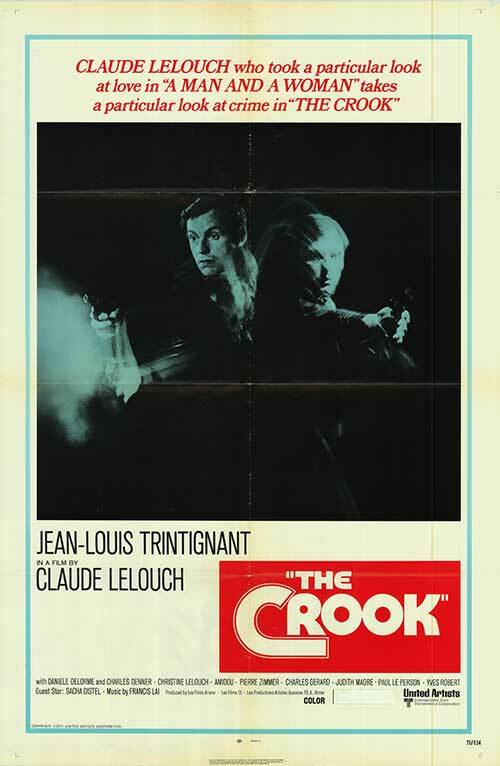 Similar to Truffaut, what comes through Lelouch’s work is a love of cinema, and The Crook is his film that most effectively conveys this exuberance. Jean-Louis Trintignant stars as “Simon the Swiss,” a notorious Parisian thief on the run after escaping from prison. Hiding out with a lonely secretary he abducts at a movie theatre, he reconnects with his ex-girlfriend (Christine Lelouch) and former partner (Charles Gerald). It is at this point the narrative circles back to their crime, a kidnapping plot that if it doesn’t surprise with its twists will at the very least plant the phrase “Merci Simca!” in your mind forever. The film has it all: a musical number, a “movie within the movie,” a little social satire, and a nonlinear timeline that trusts in the viewer to eventually figure things out. Trintignant is a cool, inscrutable anti-hero, but Lelouch takes the opposite approach to Melville—whereas Melville conveyed his thieves’ existential angst through a minimalist style, Lelouch isolates by surrounding him with all sorts of nonsense. Through it all, Trintignant reacts with a blank but charming insouciance, only showing signs of concern with food and drink (“biere, sans mousse”). Self-aware but never cynical, the script’s elliptical approach not only keeps the viewer on edge but also creates the room for all sorts of fun bits of action. There are a number of memorable filmmaking touches (the way that Lelouch shoots his police interrogation scenes should be copied), and even sequences that seem conventional (like the inevitable car chase) take a unique turn. Besides longing for the days of a more relaxed penal system (oh, how much easier it was to write prison break scenes! ), The Crook is a reminder that just because a film has a familiar storyline and generic title doesn’t mean that it can’t find its own unique spirit.